Q: Do I need to take an annual membership for my second event? A: If you have taken advantage of our introductory membership offer, you will need to upgrade your temporary membership to an annual membership to become a full member, don’t worry the cost of your temporary membership is deducted from you annual subscription, speak to our Regiment adjutant on the day so you can fill in the appropriate form. Q: Can I still borrow kit for my 1st season? A: You can still borrow clothing from the Regimental Quartermaster, but you will be expected to gradually buy your own clothing throughout the season and hopefully by the end of your 2nd season you will have all of your own kit including authentic footwear. Q: Do I need to buy any weapons or armour to take part? A: Pikes and dummy muskets, are provided to the members to use throughout the muster season, if you are a musketeer and obtained the correct legal documentation in your 3rd season might like to start saving up for a live firing musket, and a tuck (sword) if you chose to complete a swords test, likewise if you choose to be a pikeman you might want to invest in your own back and breast and helmet. Q: Where can I buy my clothing from? 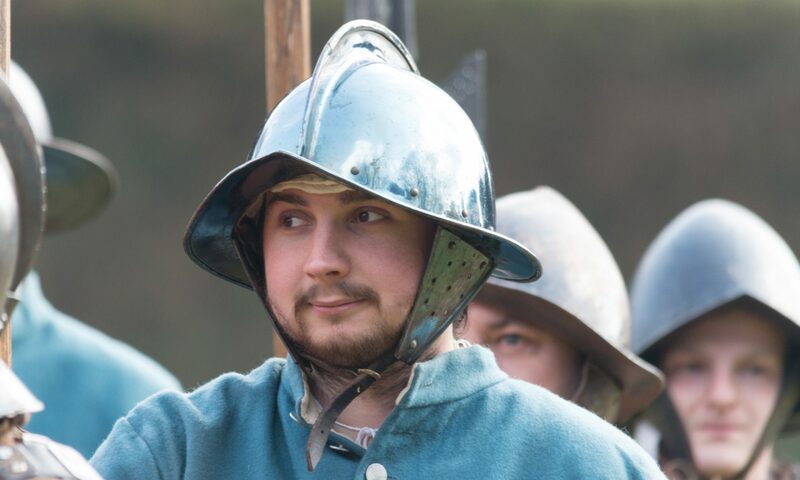 A: Our primary identity as a re-enactment group is to represent a company of the Earl Rivers Regiment just after it had been re-equipped at Wallingford Castle in 1643. We wear blue suits and caps made to a well-researched Colour and pattern, to order your uniform please click here, you will need to register to our Regimental forum to access the measurement order form. Q: Will I be expected to turn up to every event? A: Not at all. This is our hobby and hopefully will be yours too. We hope that you make the musters that the Regiment decide we can mostly all make. We understand that your life has other commitments such as work and family and they take precedence over us. Q: What if I don’t know what role I want to take? A: No panic. Many members have changed their role at least once in their life with the Sealed Knot. Your role is not set in stone. But always talk with someone in the Regiment if your not sure and I’m sure they’ll point you in the right direction. A: There are health and safety rules for every role you take whether it be in the Pike block to civilian in the crowd lines. Pikemen have the most engaging role on the field and suffer bruises and scrapes, but we say this is in a level with a game of rugby. Musketeers can be knocked from swords to musket butts, but not on the level of the Pikemen. Anyone dealing with black powder on the field must under go training and tests as well as hold the right licences issued by the police, these are checked by the Sealed Knot. If there is an injury you are seen by our own team of medics, The Sealed Knot Medical Service are staffed by qualified doctors and medics, so you are in the best possible hands. At larger musters you will see their ‘base’ next to the battlefield and they are also out on the battlefield too. They wear black uniforms with large white crosses on their front and back. A: If you want to be part of the display then yes. But the choice is yours, the only thing we do not allow is a mix of 17th and 21st century clothing when we’re in the public eye, this does not include the ‘plastic‘ camp where members of the public are not allowed. It’s a little weird to be dressed in funny 17th century clothing to begin and you and your friends will get a good laugh at each other dressing up. All of us certainly did when we started out. Then again most people walk onto the camp ground and stay in 17th century dress until they leave, some even going home in it! And there’s nothing like a warm woollen doublet, cloak or soldiers coat to keep you warm round the camp fire while you drink, sing and chat the evening away.